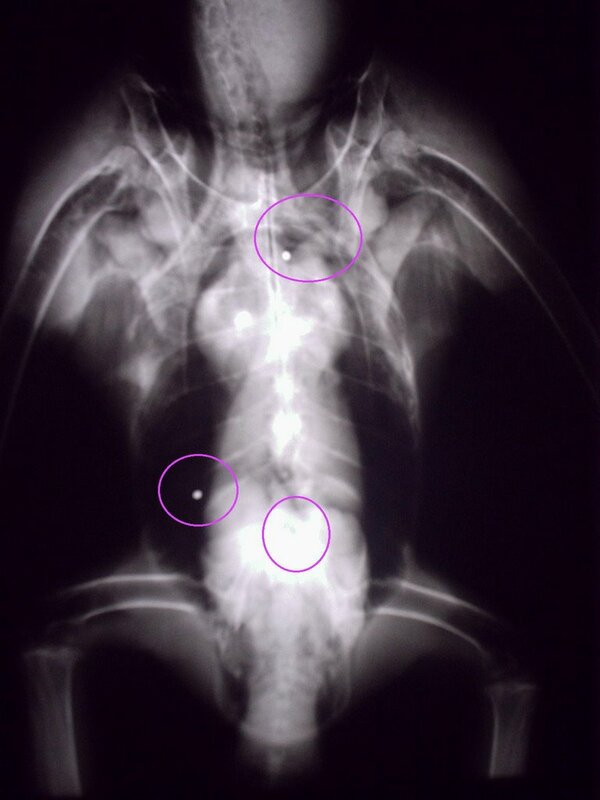 Our first eagle of 2006 is a gun shot victim. Check out the x-rays at the left and count the pellets. 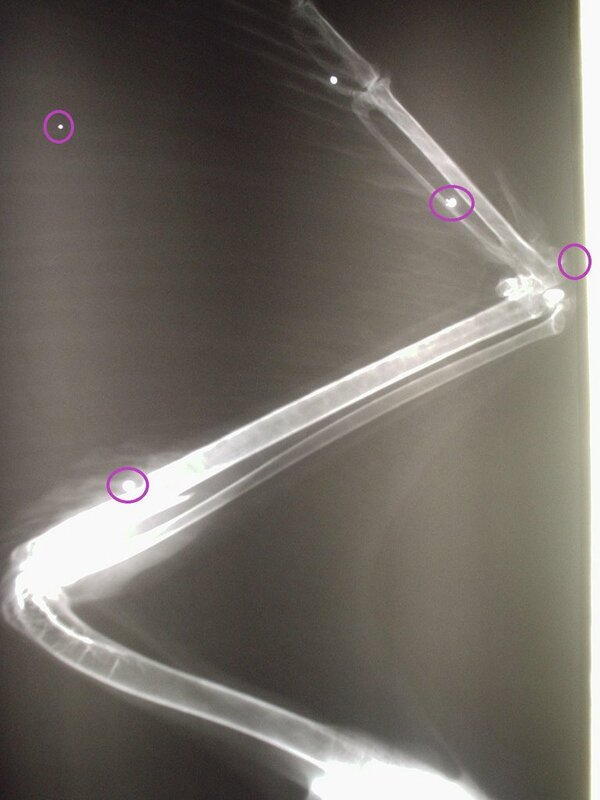 We believe he fractured his right wing after being shot and trying to land. He was spoted in Wasilla on the side of the road with his wing drooping. He was recovered by Brent, one of our volunteers that live in the area and he brought the injured eagle into Bird TLC. These type of injuries (biting tongue) to eagles are not uncommon. It happens all over the U.S., not just in Alaska. Why is what baffels most of us. There is no sport in it. You don't want to eat them. You can't keep it as a trophy. Who can stand up and act patriotic and then go out and shoot at the national symbol? This majestic bird of prey beloved by so many. This guy will be with us for a while. He'll sit out the rest of winter while his wing heals. If all heals well he'll go to our flight center to get his strength back. Then if he proves to us that he can survive and hunt on his own, he'll be released. As you've read in my other post, this is illegal. If you know of someone injuring wildlife, it's your duty as a human being to report it to the authorities. Stop Senseless killings and endangerment to our wildlife! On another note, THANKS to all of the people donating salmon to the birds at Bird TLC. 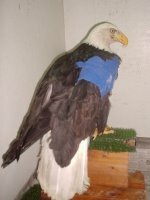 We had a total of 51 eagles in 2005. Many of them are still under rehabiltation at our clinic or flight center. It takes a lot of food to keep these birds healthy. Thanks for thinking of us. We're still taking donations of uncooked & unseasoned salmon. If your cleaning out your freezer, think of us. Call 562-4852 for directions. Bird TLC is not open for tours. We are a emergency clinic for sick, injured or orphaned wild birds. If you want to see wild birds, visit the Alaska Zoo or Alaska Wildlife Conservation Center.